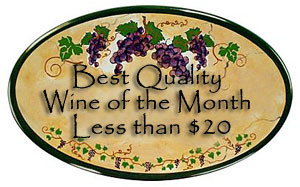 Synopsis, Our Opinion: Unusual Roussanne that has excellent potential. 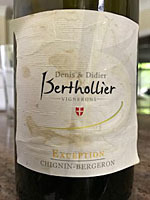 Producer/Winery: Denis and Didier Berthollier; Chignin, France. Grape Variety: Roussanne (called Chignin Bergeron in Savoie). Geographic Appellation, Region, Country: Chignin Bergeron; Savoie, France. 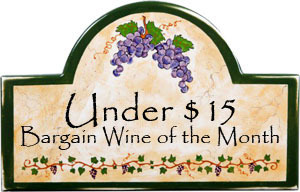 Paired With: Chicken Marsala on basmati rice with fresh from the garden corn-on-the-cob. Chilled before drinking. Clear, dark golden color. Strong honey, Pope Paul rose blossoms, ripe apple and corked aromas. Smooth, mineral, tart, slightly creamy, solid medium body and a 150-grit texture, but unfortunately this bottle was a tad corked. Strong tart apple, apricot and mineral flavors with lesser amounts of raisins and unidentifiable citrus. Fresh acidity and a long, SMOOTH, slightly creamy and mineral dominated finish and aftertaste. An interesting wine that was dry, yet fruity sweet as it warmed. It was tainted just enough to know it was corked; but not enough to cover the characteristics of the wine. We only gave it a two-thumbs up rating because it was tainted, but it clearly had the attributes for a first-rate wine!!! Unusual Roussanne that has excellent potential. Photo from Denis and Didier Berthollier. 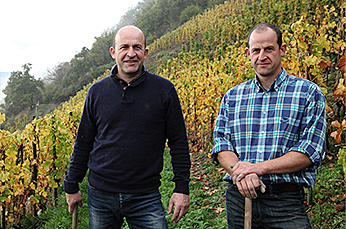 Comments: Learn more about Denis & Didier and their wines. Imported by: Weygand-Metzler; Unionville, Pennsyalvania.